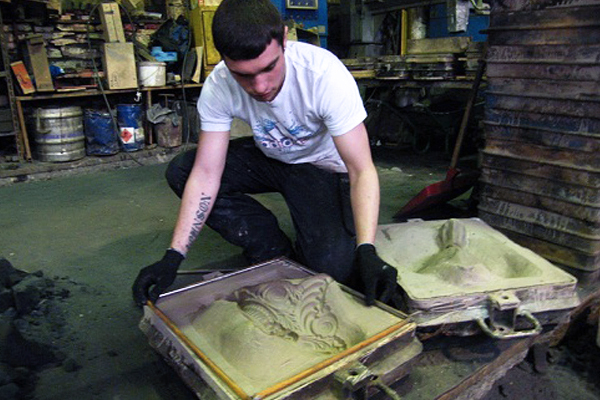 Producing Iron, its alloys and Aluminium using either Furan or Greensand Systems we have the capability to offer intricate designs, one off castings or high repetition work. The green sand plant has three BMM jolt squeeze machines offering box sizes of 380 x 380, 300 x 460 and 460 x 530 for maximum pattern layout. The Furan plant has three independent sand mixing machines linked to two separate sand reclamation plants. Molten metal is produced by using an Inductatherm Induction furnace with two 400KG bodies and a Taylormade Induction Furnace with a 300kg body. This set up gives us almost guaranteed production capability in any eventuality. • Electric Induction melting facilities – with capacity 3000kg per day maximum casting weight of 300kg.